TD Bank, which has hundreds of branches on the East Coast and calls itself "America's most convenient bank," certainly appears to be the most convenient for thieves who hide themselves under face-covering veils. Over the past six months, TD Bank has emerged as a destination of choice for those criminals preferring the anonymity afforded by extreme Islamic attire. The trend started on August 10, when a man described by police as wearing a "long black burqa over his face" — almost certainly a niqab rather than a true burqa — pulled a gun at a TD Bank branch in Maryland, demanded money, and escaped with cash. Each time, she wore a burqa — a traditional Islamic garment that covers the face. Police say she's also wanted for robberies at TD Bank branches in Pennsylvania and New Jersey. In both of the Delaware robberies, police say Jones handed the teller a note demanding money and implying she was armed. Police say she was accompanied by another woman, also wearing a burqa, during the second robbery. October 15 looks to have been a busy day for Jones, as police believe her to be the female "wearing a black gown and headdress covering most of the face" who robbed a TD Bank branch in Pennsylvania hours after the Delaware hit. Note the picture of her from the security camera. Jones apparently erred by leaving her niqab at home during a holdup of a TD Bank branch in New Jersey on December 5. Sporting only a headscarf and sunglasses, she allegedly lured tellers into the vault before stealing $103,000 at gunpoint. She was arrested days later and reportedly admitted to all four heists. Amazing what the ability to see someone's face can accomplish. Is it just a coincidence that the most recent U.S. bank robberies involving Islamic veils have focused on TD Bank? Islamist Watch spoke with TD's public relations chief, Rebecca Acevedo (rebecca.acevedo@yesbank.com or 856-470-3201), to alert her to this trend and ascertain whether the bank's policies are making it a soft target. Though understandably reluctant to discuss detailed security measures, she did offer an intriguing clue as to why her institution might be attracting burqa bandits. When informed of signs posted by many other banks ordering clients not to wear hats, hoods, or sunglasses — much to the chagrin of CAIR — Acevedo stated that TD Bank branches have never put up anything comparable. 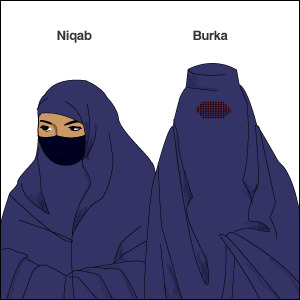 This suggests that greater permissiveness toward head and face coverings has contributed to the crimes outlined above. Some deny the problem, but criminals concealed by the strictest Islamic garb present a growing threat. IW urges readers to contact their own banks and ask what is being done to counter it.